Ready your orange apparel! Koninginnedag is just a few winks away! What's Koninginnedag and when is it? Koninginnedag is one of the national holidays celebrated by the Dutch in the Kingdom of the Netherlands. Translated into English, Koninginnedag is Queen's Day and it is celebrated with much aplomb every April 30. Which Dutch queen is being given honor on this holiday? The current queen of the kingdom! At present, Queen Beatrix sits as queen of the Dutch people. 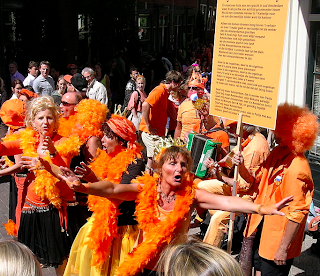 Women dressed in orange during Queen's Day in the Netherlands. Queen's Day celebrations and events allow the people of the Netherlands to let their hair down and party indoors as well as outdoors. Festivities begin the night before Koninginnedag at bars, restaurants and other places. By the next morning, everyone can enjoy the carnival-like festivities and mood in many places around the country. Koninginnedag or Queen's Day truly highlights the warm hospitality and fun-loving nature of the Dutch. 1885 was the year the Dutch first celebrated Queen's Day. Back then, it was actually called Prinsessedag, translation: Princess's Day. It was held on August 31as a way to celebrate the beloved Princess Wilhelmina's birthday. At that time, Princess Wilhelmina, who was born on the 31st of August, was only 5 years old. Her date of birth was one day before schools in Holland opened or the last day of the school break. Different activities were organized for children during Prinsessedag. Utrecht was the very first town to observe this holiday. But it became so popular that Princess Day soon spread across the Kingdom. Queen Beatrix of the Netherlands and Prince Willem-Alexander in Woudrichem on Koninginnedag (2007), accompanied by the mayor of Woudrichem. Princess Wilhelmina was the sole heir to the throne of King Willem III. And when her father abdicated his throne in her favor in 1890, she became Queen Wilhelmina of the Netherlands. To continue celebrating her birthday, August 31 was designated as a national holiday the Dutch call Koninginnedag or Queen's Day. Queen Wilhelmina was ruler of the Netherlands for a good 50 years. In 1948, she abdicated her throne, passing it on to Princess Juliana, her only child. The national holiday Koninginnedag was then moved to Queen Juliana's birthday, which was April 30. From that day, celebrations were held during springtime. After 32 years as queen, it was Queen Juliana's turn to abdicate her throne. Since she had 4 daughters, her responsibilities were transferred to the oldest among them, Princess Beatrix. The queen's crown was placed on Princess Beatrix's head on April 30, 1980. Since Queen's Day is usually celebrated on the birthdate of the current queen of the Netherlands, for a while, the population of party-loving Dutch back then probably held their collective breaths. Why? Because Queen Beatrix was born on January 31, the height of wintertime in Holland. A collective sigh must have been heard (figuratively, of course) when, upon her coronation, Queen Beatrix announced that Queen's Day was to continue to be celebrated every April 30. It was Queen Beatrix's way to honor her mother Queen Juliana. A quick note: if April 30 is a Sunday, Queen's Day is automatically moved a day before on April 29th. There is already much activity the night before Queen's Day. A number of parties and concerts are held to celebrate Koninginnenacht or "Queen's Night." The younger crowd takes to the city streets and squares to party the night away. The next day, April 30, Koninginnedag explodes in a sea of orange with orange madness or "oranjegekte." The streets will be full of people wearing orange garb from clothes to shoes to accessories and other items. Orange hair is not frowned upon on this day. Orange-colored food and beverages are commonly offered. Why the orange craze you ask? Orange rules Queen's Day in honor of the House of Orange-Nassau, the current ruling family of the Netherlands. On Queen's Day, vrijmarkt or "free markets" are held in different locations throughout the country. The Dutch love their "free markets" or "flea markets." 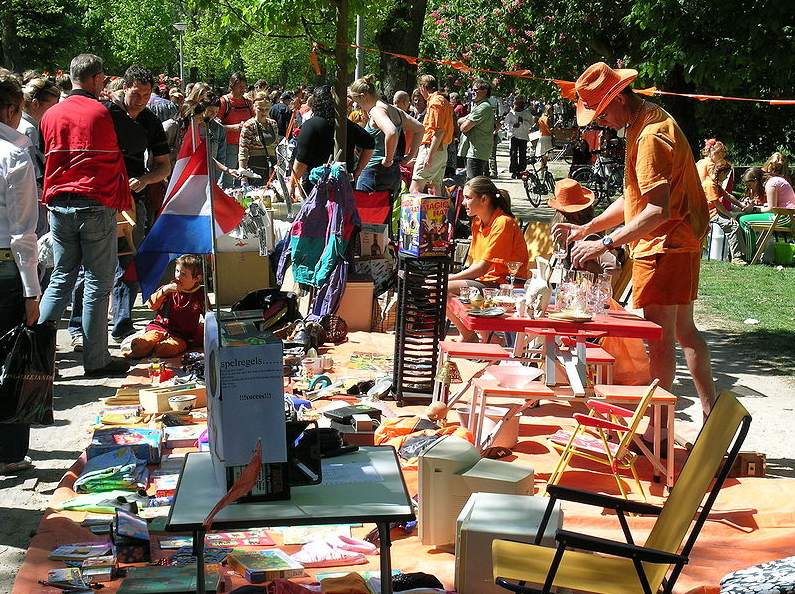 Queen's Day is the only day the government will not require sellers to get permits to sell. Value Added Tax is also not collected on this day. What is sold at Koninginnedag vrijmarkt? The Dutch have a long history of trading. 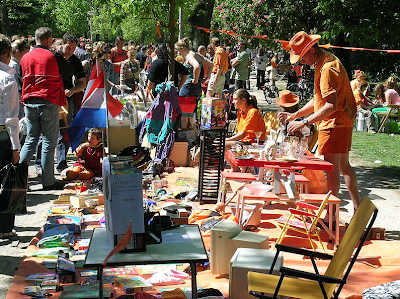 And on Queen's Day, many of them sell or trade their crafts, knick knacks, odds and ends, used clothes, old toys, electronics, books and other things with family, friends and neighbors or just about with anyone else who will be interested in their wares. This tradition of holding vrijmarkt started in order to take away the focus of the Dutch from the marriage of then Princess Beatrix to German born Klaus-Georg von Ambsberg. The Dutch were unhappy that the husband of their Princess was born a German and served the German Army in World War II. During their wedding day in 1966 and also during successive observances of Queen's Day, anti-German riots were held in Amsterdam. The government made a decision to open the city center of Amsterdam to a "free market" as a way to discourage demonstrations. The "free market" was situated in the same place where previous anti-German demonstrations were held. Soon, the vrijmarkt became a Queen's Day tradition. One Koninginnedag tradition that Queen Beatrix instituted was visiting at least 2 Dutch towns and joining the local festivities. This replaced the time-honored tradition that started during her great grandmother, Queen-Regent Emma's birthday. The Queen-Regent Emma used to receive a floral presentation from the townsfolk at her abode, Soestdijk Palace. This tradition continued on up to Queen Juliana's time. However, Queen Beatrix wanted to go to her people instead of her people going to her, via the floral tribute. 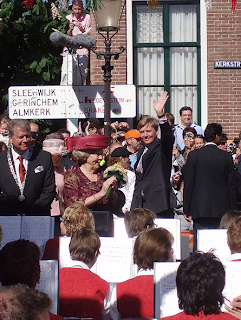 Since 1981, Queen Beatrix has visited more than 50 towns in her beloved country. Queen's Day is a big birthday party like no other in the world. People in their orange outfits and even those who do not subscribe to oranjegekte have a number of choices when it comes to activities and events they can participate. The free markets have traders' and sellers' stalls as well food and beverage stands. Concerts and other music-related events are not lacking on this day. A cornucopia of activities for children are lined up for their enjoyment during this holiday that actually started Prinsessedag. Koninginnedag is one national holiday the Dutch look forward to. It is essentially a large-scale birthday party for the current queen of the Netherlands with the whole country in attendance. If you ever find yourself in The Hague, Rotterdam, Amsterdam and other cities and towns in the Netherlands on April 30, make sure you have your orange party outfit and get ready to join in on the carnival-like atmosphere during Queen's Day. And if you plan to do some shopping, make sure to memorize this: "Hoeveel kost dit?" It means, "how much is this?" in Dutch.